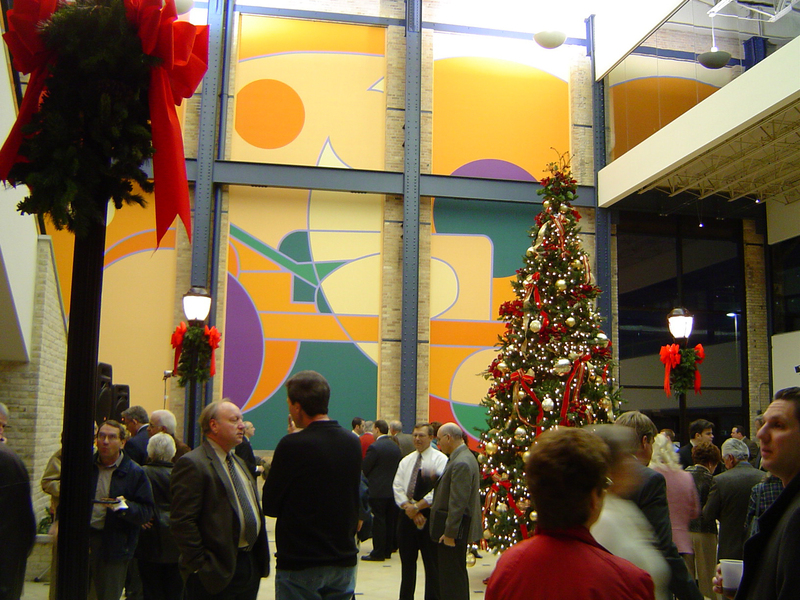 Holiday celebration in the newly rehabilitated Summit Place, originally part of the historic Allis-Chalmers manufacturing complex. Situated in the southeastern corner of the state, West Allis, Wisconsin, (population 61,254) was first called Honey Creek when it was settled in 1835 as an agricultural community serving the greater Milwaukee area. In 1891, the Wisconsin State Fair found a home in North Greenfield, within the city limits of current-day West Allis. Three years later, Milwaukee Street Car Lines extended service to North Greenfield to give Milwaukee residents easy access to the fair, spurring the area’s growth and development. In 1902, the residents of North Greenfield voted to organize their village and call it West Allis. It was around this time that the city’s industrial economy took hold, founded on the Edward P. Allis Company, which employed 3,000 people and manufactured $6 million worth of tractors and other farm equipment per year. The company was the backbone of the West Allis economy from 1914 to 1985. In 1987, it filed for bankruptcy, and the city lost more than 15,000 jobs. Today, the city is home to a variety of large corporations, including Siemens Power Corp. and Quad Graphics, a national printing firm. West Allis continues to host the Wisconsin State Fair every August. The former Allis-Chalmers manufacturing site has been dramatically redeveloped, although its historic character has been preserved, and it has received statewide acclaim as a model of “re-urbanization.” Now called Summit Place, the building serves as an anchor for downtown historic shopping, dining, and arts performances. The West Allis Historical Society maintains a museum that features a country store, a turn-of-the-century general store, a blacksmith shop, and a furnished school classroom circa 1887.